Christmas in July has me so excited for the magic of Disney at Christmastime! 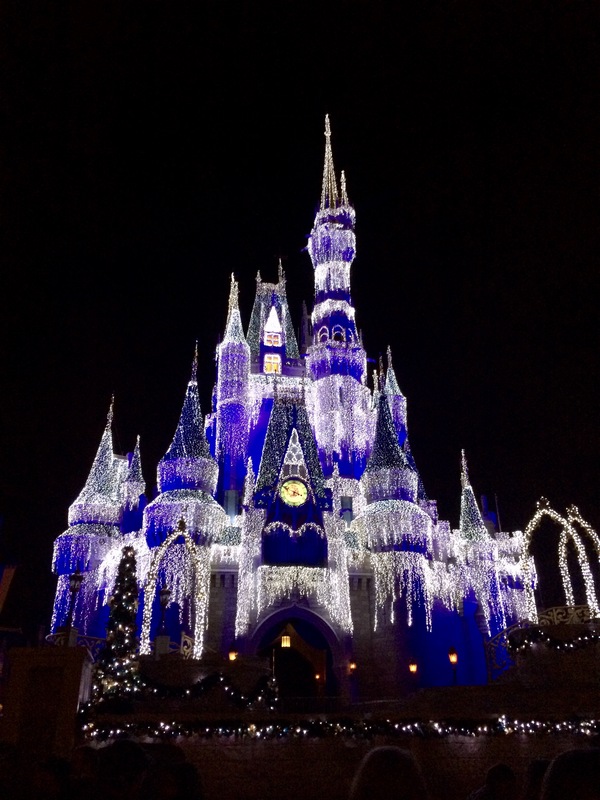 I’m taking a look back at my one and only trip to Disney World at Christmastime and looking ahead to my upcoming trip, which will be my 2nd Disney Christmas experience. We just love seeing the castle lit up for Christmas! More than anything, I couldn’t wait to see Cinderella’s Castle lit up for Christmas. I often tell my husband (then boyfriend) that it’s not her castle, it’s my castle. With over 200,000 lights draped over the gorgeous castle, it is truly something out of a dream. I spent so much of the trip just staring at the castle. We ended up in Magic Kingdom in the evening all but 1 night of our trip. I just couldn’t help myself! We also spent as much time as possible exploring every little Christmas tidbit we could throughout the entirety of Walt Disney World. While we were there, we went for a Disney Vacation Club information session at Saratoga Springs. After the session, we got to hit up an ice cream bar and they had this adorable wreath and tree! One of my favorite things about Disney World, at any time of year, is how well themed everything is. There are details you’d never even think about that Disney has thought of and designed perfectly. One evening of our trip, we decided to hop the monorail from Magic Kingdom and check out the trees and Christmas displays at the three Magic Kingdom area resorts. The Grand Floridian did not disappoint with a tree over 3 stories tall and a massive gingerbread house with a gift shop inside it! One of my very favorite parts about Christmas at Disney is something I’m sorry to report is no longer there. After 20 years of illuminating Hollywood Studios (and MGM Studios before that), The Osbourne Family Spectacle of Dancing Lights has been retired. I am so thrilled I was able to see it once and I will cherish the memories of it forever. We didn’t go on this trip with my parents but we were there at the same time so we had to meet up for a photo op! Hubby and I also checked out Mickey’s Very Merry Christmas Party (MVMCP) while we were there. The party runs certain dates throughout November and December in the Magic Kingdom (more info on 2017 dates can be found here). The event is only available to guests who buy tickets, which are separate from your park tickets. If you’ve spent the day at Magic Kingdom, you’ll be able to get a wristband from a cast member as party time approaches and will be permitted to stay in the park once they begin herding non-party-goers out. The Christmas party ticket gets you a special parade and fireworks show in addition to milk/cocoa and cookies at various places throughout the park! I have to confess that I personally wasn’t impressed. All the cookie stops had the same items and it wasn’t as cheery as I thought it’d be. The parade and fireworks were fabulous, but I didn’t really think it was worth the money. Since that trip in 2013, they have made some changes to MVMCP and a friend of mine has gone since and absolutely loved everything about it! If you’re on the fence and want my opinion, I say go for it. It’s not something you need to do each time you’re in Disney at Christmas, but I’m really glad we did it. We may even consider doing it again on this trip since it’s different from our last party. Thanks for getting in the spirit with me in the hot summertime!